What’s it like to sit in a room full of people and be the only person of color? To look around and see no one who looks like you? This is a question that I have to explore on almost a daily basis. As a black woman in veterinary school, it is a normal occurrence to be either the only student of color or one of a select handful. Unfortunately, this occurrence is likely to repeat itself many times throughout my veterinary career. There’s a subtle isolation that occurs when you are a singularity, and until you’ve experienced it, it can be difficult to appreciate the feeling. I am in love with the profession of veterinary medicine and excited to build a future around it, but I often feel like an outsider. I will admit the foundation of this essay is not research. It is largely anecdotal and entirely from my personal perspective as a minority student. Too often I think we get distracted by statistics and take comfort in positive trends and forget to look at issues on an individual level. It is a known fact that veterinary medicine is one of the least diverse medical professions. Whether speaking of diversity in terms of ethnicity, gender, religion or sexual orientation, we as a profession fall short. Many steps have been taken to change this, such as the AAVMC’s DiVersity Matters initiative, the Iverson Bell Symposium, and organizations such as Veterinary Students as One in Culture and Ethnicity (VOICE), but this fact remains true. One of the issues that stands out most to me is lack of socioeconomic diversity within the field. The cost of a veterinary education is so high that even with loans, only a certain tier of people are able to attend. The financial burden of veterinary school is a major deterrent to underrepresented groups and if not addressed, will lead to veterinary medicine being a career for the “privileged”. There are many people that fully deserve a veterinary education and have the potential to make an impact in the field but are not able to manage the expense of veterinary school. This will be to the detriment of the veterinary profession. During my undergraduate career the focus was entirely on the academic challenge of getting into veterinary school and although this was important, I feel the financial undertaking should have been of equal importance. I sat through advising lectures on keeping my grades up, when what I really needed to know about was the debt load that lie ahead and how to manage my money. I didn’t fully realize the financial burden until I received my acceptance letter to veterinary school, and it was such a shock that I seriously considered not attending. I’m sure many other students, especially those from underprivileged backgrounds, find themselves in the same situation. Speaking from personal experience, I can say that what sets me apart even more than the color of my skin is my financial background I grew up dependent on government assistance in a single parent household, which often makes it difficult to relate to my classmate’s life experiences. As I have stated before, cost and debt management can be a roadblock to minority applicants and I certainly see that reflected in my peers. With effective financial counseling at an undergraduate level, we can show students feasible ways to finance their education and manage their debt which will, hopefully, diversify the applicant pool. Another important issue to consider regarding underrepresented students is mental wellness. There is a rightful focus on the mental health of veterinarians and veterinary students. However, I would argue that underrepresented students are at greater risk for mental health issues. In addition to the inherent stress that is veterinary school, minority students may face additional stressors that include feelings of isolation, imposter syndrome, microaggressions, or even outright discrimination. I myself frequently experience disconcerting thoughts such as; “I only got into veterinary school because I’m black. There must have been a more qualified white applicant.” and “It’s not good enough to be in veterinary school, you need to be the best so you can prove that you deserve it.” It’s easy to see how these thoughts can spiral into a precarious mental state. 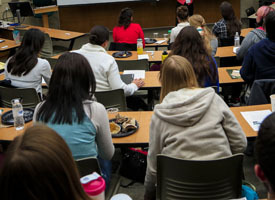 Being watchful and aware of the unique issues facing minority students should be an integral part of any mental wellness program. The world is a very diverse place and those that serve it must reflect that. There should be a breadth of veterinarians of all ages, races, ethnicities, and sexual orientations. The lack of diversity in our profession is doing harm not only to our clients, but more importantly, to the patients we treat. This is a multifaceted issue that will require a multifaceted solution. Despite this, I am confident that the continued implementation of diversity initiatives, a determination for forward change, and an ongoing open conversation will help lead us in the right direction. Lack of diversity in veterinary school impacts animals too. There are segments of the pet-owning population largely going untouched by animal service providers. Socioeconomic status and race and ethnicity are intimately intertwined. African American, Native American, Hispanic, Pacific Islander, and Native Hawaiian families are more likely than Caucasian and Asian families to live in poverty. 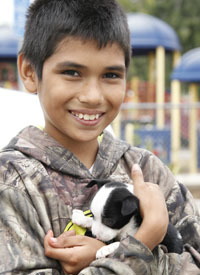 Sadly, children living in poverty often do not have the same advantages as their wealthier peers, making it difficult for them to achieve the academic success necessary to gain admission to veterinary school. 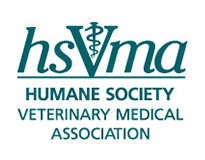 Recognizing that people’s love for their pets transcends socioeconomic circumstances and cultural differences, HSVMA’s Rural Area Veterinary Services and The Humane Society of the United States' Pets For Life programs have been working to provide access to care in low-income communities. To learn more about these critical programs and how you can get involved, visit hsvma.org/ravs and humanesociety.org/petsforlife. Ty Marshall-Blanche is a second year student at Western University of Health Sciences (Class of 2018). She serves as co-president of Students of Color and Allies Outreach Retention and Education (SCORE) club. SCORE is dedicated to pioneering outreach programs for underrepresented students as well as improving climate and inclusion for current minority students. Ty is also very active in other extracurricular activities. 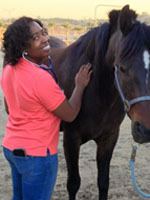 She is the current veterinary liaison for the Pomona Homeless Outreach Program, the vice-president of the Student Chapter of the American Association of Equine Practitioners, and the secretary of the Student Chapter of Bovine Practitioners. After graduating she hopes to pursue a career in mixed animal medicine.